Fireglass Special : Gold Reflective and Silver Mixed Fireglass at $6.95/ lb. Make sure to include STRW15 discount code for the month of December. With Christmas and New Years upon us, customers are always looking for the latest in design and home decor to impress their guests. Well, if you’re reading this you’re off on the right track. Years back fire glass crystals, glass rocks or fireplace crystals as many have called it, was extremely rare and expensive. Fast forward to 2012, home-owners and designers can fully take advantage of Glaz Chips amazing deals and prices on fire glass crystals. You may look around and compare our prices, but truth to the matter is Glaz Chips Fire Glass tempers and tumbles its own fire glass straight from its facility making it far less inexpensive than its competitors. Without further a do, Glaz Chips Fire Glass is offering its top of the line premium fireglass mix to its special. Bring elegance and vibrancy to your indoor gas fireplace or outdoor gas fire pit with Gold and Silver Mixed Fireglass at a price of $6.95/ lb running through the month of December. Whether you want a beautiful contrast for your fireplace or want to bring a little bit of Las Vegas into your home then Gold and Silver Mixed Fire Glass is right for you!!! As a token of our appreciation lets add a 15% discount to your order by entering STRW15 at the checkout window. Free shipping is also available for orders over $99. Now those are some nice savings this holiday season. Glaz Chips Fire Glass hopes you enjoy your fire glass crystals and helped you save some money to purchase more and important gifts!!! To purchase fireglass product please visit our Official Glaz Chips Fireglass Website. Why Not Propane Gas? : Propane gas is a dirty gas by the nature of its chemistry and would eventually create a layer of debris and cause your fire glass crystals to appear dirty over time. Although propane gas can be used with fire glass, we advise using darker colors such as Black Fireglass, Black Reflective Fireglass, Deep Blue Fireglass, Gray Fireglass, Gray Reflective Fireglass, Bronze Fireglass, Bronze Reflective Fireglass and Green Reflective Fireglass. Minimal maintenance is required when using propane. A simple wash with clean water will do. Please do not use household cleaning products to clean your fireglass. How much fireglass will I need for my fireplace? Easy! Follow our simple instructions on our Fireglass Online Calculator. Our Fireglass calculator will compute for standard indoor fireplaces, square or round fire pits. Categories: Fireglass Sales, fireplace, holidays | Tags: fireglass calculator, fireglass crystals, fireglass rocks, fireglass sale, fireplace crystals, glass crystals, glass fire pebbles, glass fire rocks, gold fireglass, indoor gas fireplaces, outdoor gas fire pits, round fire pits, silver fireglass, square fire pits | Permalink. Ten days until Christmas! Did you finish your shopping for that hard to shop for family member or friend? If not, do not worry, we have the perfect idea. Glaz Chips Fire Glass is the perfect stocking stuffer, minus the stuffing in the stocking since it is glass. However, it does look great when it is placed in a natural gas fireplace or fire pit. Looking for that unique gift at an amazing price? Check out our website, www.glazchipsfireglass.com for amazing deals and unbelievable savings for the month of December. As many know, Glaz Chips fire Glass is hassle free when you consider the typical maintenance of a fireplace or fire pit. That stress is obsolete with our fire glass, so why not make your loved one’s life easy with this amazingly stunning gift? We also have the necessary stainless steel hardware to complete the look of modern elegance whether it be for use in your indoor fireplace or outdoor firepit. Choose from a vast array of colors; premium fireglass, reflective fireglass , popular pre-mixes and watch the flames dance gracefully over your fire glass crystals. Like many of the special people in our lives, you probably hear them talk about the desire to redo their home with the latest trends, but the cost of doing so is astronomical. That is certainly not the case with Glaz Chips Fire Glass. Help your loved ones start the remodeling process at an affordable price. You can let them have all the fun with the choosing of colors with our new gift certificate option. When we say affordable, we mean it. For the month of December, Glaz Chips Fire Glass is offering everything at a 15% discount which also applies to our gift certificates. You cannot go wrong with a gift like this. This holiday, be the one with the new, fresh idea for your family and friends. Give them the everlasting gift for their home and they will love you for it when they create lasting memories by their new and contemporary fireplace or fire pit. Categories: decor, fireplace, holidays, home | Tags: christmas ideas, creativity, design, discounts, holiday season, home, projects | Permalink. 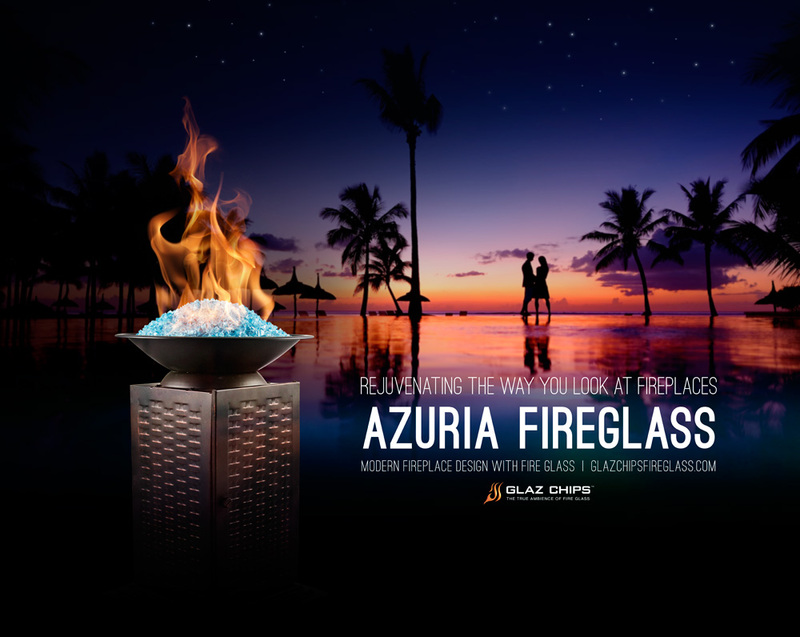 As we part ways with 2011 and prepare for 2012, Glaz Chips Fire Glass maintains its glory as a home décor trend; even restaurants and resorts are hopping onboard. What makes Glaz Chips so unique? First, it is the new sleek, modern décor for fireplaces and fire pits. It is also hassle-free, in terms of installation and upkeep. Lastly, people have the liberty to express their style and creativity. When we think fire, each individual has a different perception, such as entertainment, radiance, warmth, romance, or bonding time around these brilliant flames. Glaz Chips gives people the opportunity to take that imagery and take it a step further with fire glass. 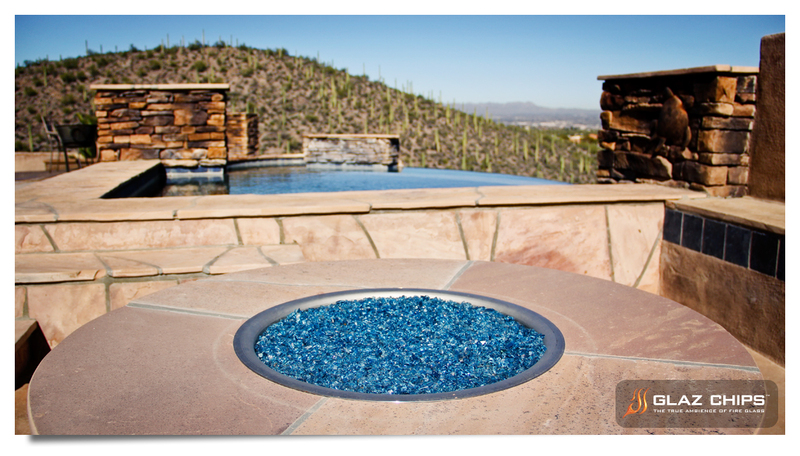 Glaz Chips Fire Glass is tempered glass with a solid or reflective color for the placement within natural gas fireplaces, fire tables, and fire pits. The urbane presence it adds to your lustrous flames is breathtaking. The fireplace and its fire friends have gained a poor reputation throughout the years. It is costly to properly maintain. It is too much of a hassle to clean and sometimes the mess finds its way outside of the fireplace and on carpets. Not to mention, logs are a necessity in order to uphold the ambiance. However, Glaz Chips Fire Glass does not require you to stray from your fun. All it needs is an occasional rinse and dry, then back to your natural gas fireplace for your next R&R. Style and creativity is a luxury in our lives. Glaz Chips Fire Glass allows you to easily express yours with mixing and matching. This fire glass has popular pre-mixes for you to choose from, making modern elegance at your fingertips. Let yourself be the interior designer this time and relax by the fire, enjoying your creation. In sum, Glaz Chip Fire Glass allows you to be the trend setter. Categories: decor, fireplace, holidays, home | Tags: creativity, design, entertainment, family, home, projects, shopping. environment | Permalink. Our Gold Reflective Fire Glass is a popular feature in fireplaces and fire pits. The reflective in our glass allows your fire appliance to have that extra shine, regardless of it being in use or not. Choose from favorite options such as azuria-gold reflective, black-gold reflective, bronze-gold reflective, or green-gold reflective. Either way, your home is sure to shine. Categories: decor, fireplace, home, Uncategorized | Tags: announcements, business, creativity, design, entertainment, family, holiday season, holidays, home, projects, shopping. environment | Permalink.